Although it’s very cold outside at the moment, well, unless you’re in the Caribbean for instance! I’m finding that turning up the heat is a big help. Although sometimes I forget the heat is actually on and before I know it, with my many layers added, I feel very hot and in need of something rather refreshing. This happened to me last night whilst watching the football on TV, and I was so thankful that a few hours prior to this I’d made this very refreshing drink. The name is a take on the classic ‘Mojito’ however this doesn’t contain any alcohol so you really can drink as much of it as you like, and instead of using Tap water, I’ve gone with Soda water to really make it feel like a proper soft drink. Give it a go and I’m sure your family and guests will be very appreciative! 1. 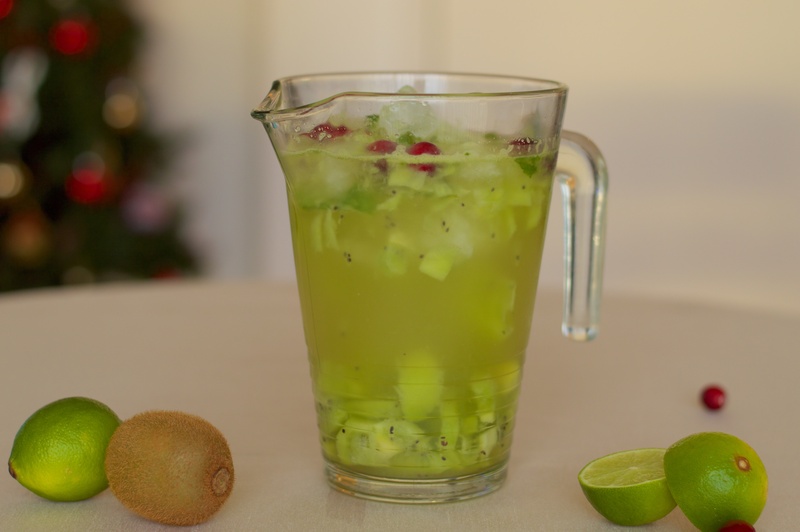 Add the kiwi, lime juice and mint leaves to a large jug (as well as the cranberries if using) and with a pestle, muddle the ingredients together. 2. Add the sugar and the cubed ice and stir thoroughly with a large spoon. 3. Top with the soda water and leave to refrigerate for about an hour.